Vancouver, BC, Canada (November 20, 2018): Get your stretchy pants ready! Dine Out Vancouver Festival’s event tickets are now available for purchase. Complementing the prix fixe menus at over 300 participating restaurants which launch January 7, 2019, culinary enthusiasts can choose from a range of unique culinary events happening between January 18 and February 3, 2019. Brand-new for Season 17 is the Bauhaus Stammtisch, presented by Bauhaus Restaurant from January 20 – 24. Inspired by Chef Tim Schulte’s childhood memories of family dinners in Germany, guests will enjoy a delicious 4-course menu at a family style long table, with the option to add a BC and German wine pairing. Also new is the Painted Rock Estate Winemakers Dinner, presented by Tuc Craft Kitchen and Painted Rock Estate. For one night only, John Skinner of Painted Rock Estate Winery will host a 4-course Pacific Northwest dinner, paired with some of BC’s best wines from his award-winning winery. Learn more about Vancouver’s historic Downtown Eastside and rich culture at the Save on Meats Experience. Indulge in a special 3-course menu based on diner classics while learning more about the positive impact the diner has within the city. Take your pick of two new events, presented by YEW Seafood + Bar. At Vive La Vodka, enjoy a vodka tasting, oyster shucking session, martini and oyster pairing, small plates, and a preview of YEW’s soon-to-launch cocktail program. At Sweet + Simple, treat your sweet tooth while learning to make three delicious desserts: a chocolate souffle, macaron, and the Chef’s favourite seasonal dessert. Returning favourites include Taste of the Market at Lonsdale Quay, a tasting tour through North Vancouver’s public market including craft beer, fresh seafood, artisan cheese and more; the Vancouver Aquarium’s Ocean Wise Pop-up, serving delicious sustainably-sourced seafood dishes from Chef Ned Bell and team; Fanny Bay Oyster Bar’s Get Shucked Up, where guests will learn to shuck oysters from the experts; Maime Taylor’s Low Country Pig Roast, featuring a Southern-inspired, three-course long-table dinner, complete with a whole roasted sucking pig; and back by popular demand, don’t miss the opportunity to grab tickets for the Secret Supper Soiree. Be sure to check the Culinary Events calendar for even more exciting events, including a range of unique culinary tours, and the return of Street Food City from January 21 – 27 in front of the Vancouver Art Gallery on Georgia Street. It wouldn’t be Dine Out Vancouver Festival without the ever-popular Vancouver World Chef Exchange, presented by Aeroplan. 2019 will welcome renowned chefs from international culinary hubs to produce a series of five collaborative dinners. Guests can expect carefully crafted tastes by featured chefs from Sydney, London, Montreal, San Diego, and Dusseldorf. Also returning is the Grand Tasting, which will kick-off the festival the Thursday night before on January 17 at the Rocky Mountaineer Station. This opening event will feature multiple restaurants, craft breweries and distilleries, and BC VQA wineries. Proceeds will benefit the BC Hospitality Foundation, Dine Out Vancouver’s official charitable partner. Tickets for all events are available now starting at $31.55, so please your palate and purchase your tickets at dineoutvancouver.com/events. Travelling to Dine Out Vancouver Festival from near or far? Take advantage of Air Canada’s 15 percent off discount code on Air Canada and Air Canada Rouge flights for all Canadian and select U.S. cities to Vancouver (use promo code DINEOUT2019). Participating hotels are offering special hotel rates starting at $89 CAD per night, plus a selection of “Dine and Stay” packages. January 7, 2019 – Aeroplan exclusive: The list of Dine Out restaurants and menus is made available to Aeroplan members, giving them a three-day jump start on securing a table through advance reservations. To get this perk, sign up for Aeroplan now. January 17, 2019 – Opening night of the festival at the Grand Tasting at the Rocky Mountaineer Station, open to the public. Early-bird tickets are $89.00. January 18, 2019 – Dine Out Vancouver Festival begins – dig in! January 21 – 27, 2019 – Check out Vancouver’s favourite food trucks at Street Food City. Produced by Tourism Vancouver, Dine Out Vancouver Festival is Canada’s largest annual celebration of food and drink. Attracting more than 100,000 locals and visitors, the festival takes over the city with 17 days of culinary events, prix fixe menus at 300-plus restaurants (at $15, $35, $25 or $45 price points), as well as “Dine and Stay” packages and special hotel rates. The festival promotes local and regional ingredients, BC VQA wines, and the city’s exceptional culinary talent. Dine Out‘s premier partner is Aeroplan; festival partner is the Wines of British Columbia; and preferred partners include Air Canada, OpenTable, Star Metro Vancouver, The Westin Bayshore, The Georgia Straight, Vancouver magazine, and Where magazine. Dine Out Vancouver Festival 2019 runs from January 18 to February 3. Join Edible Caanada on April 16th, 2018 as we’ll be hosting a five-course dinner to celebrate the coming of Spring. This evening boasts a perfectly curated menu from our Culinary Director Tobias Grignon paired with award-winning wines by Heidi Noble, the owner and Executive Winemaker at JoieFarm Winery. 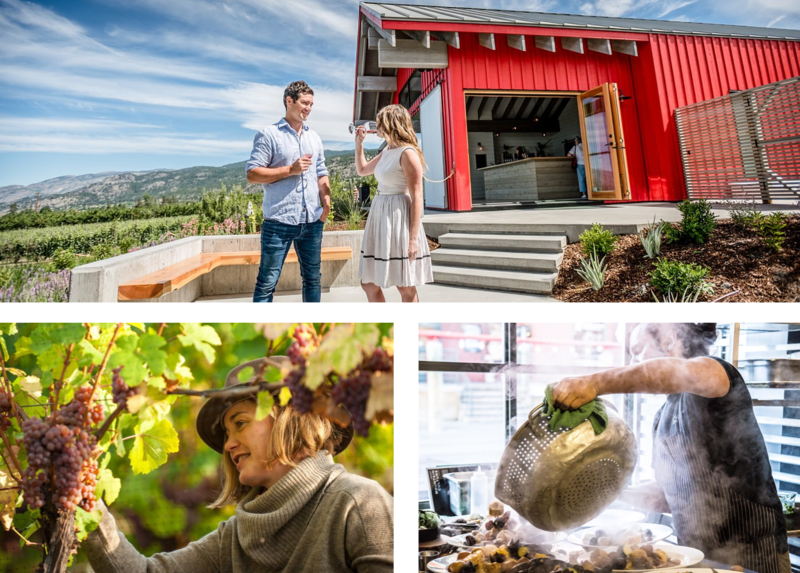 Crabs and braised Radish, Lamb Carpaccio, Duck Liver, and Steelhead with Stinging Nettles are some of the items you will be able to try accompanied by a selection of 4 of Joie’s wines and an Apricot dessert wine from Elephant Island, a fruit winery on the Naramata Bench. Joie’s wines (particularly their fragrant whites) are renowned for drinking during the Springtime. Their farm works exclusively with grape varieties of Alsace, Burgundy, and Champagne and has joined the league of Canada’s top wineries over the past years, winning the Georgia Straight’s Best Winery for White Wines Award in 2016, and the Silver Medal in 2017 for Cascadia Wine Awards. This is an amazing opportunity to celebrate the best that BC has to offer! The food menu, wines, gratuities, and taxes are included in this price. Wild Rice downtown/Chinatown has two offers during the month of August. One that I’m excited about is Bao Bei, or steamed dumplings. Here is their announcement. 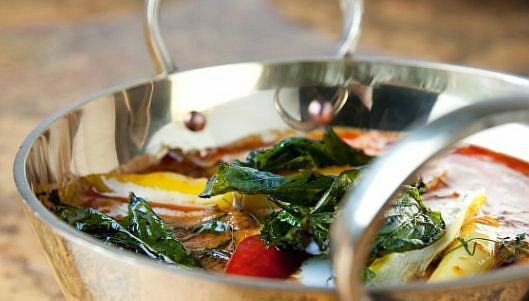 The pans and cocktail shakers are sizzling hot this month at Wild Rice. We invite you to join us for all or some of the following tasty offerings. Every Friday to August 30 – We’ve partnered once again with the Dr. Sun Yat Sen Classical Chinese Garden to present pre-concert dinner packages for the Garden’s Enchanted Evenings Concert Series. We’re offering a value-priced three course dinner for only $22. Check out the menu and book your table now. 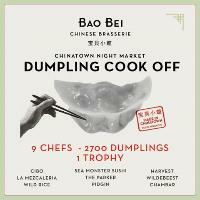 August 16 – Cheer on Chef Todd as he competes in the Dumpling Cook-Off as part of the first annual Dumpling Party at the Chinatown Night Market. Tickets are available for $12 onEventBrite if you want to try all the dumplings, or just meander back to Wild Rice for dumplings and cocktails with us. Event details here. In case you are wondering what to do with your dad on Father’s Day, why not enjoy some tasty food at Le Parisien downtown? Enjoy that steak with a red Bordeaux blend or an oaked, buttery chardonnay. Come join us on Sunday June 16th to celebrate Dad. We’re offering a free freshly baked croissant for ‘Dear, Old Dad’ for Brunch and for dinner he’ll be able to choose from four premium cuts of steak and sauces at great prices that will surely put a smile on the ‘the old man’s’ face. Have you thought about what to do for Valentine’s Day? Taking your significant other out for dinner should be on the top of the list (unless you prefer to cook a dinner), but where to go? One place may be Vicino Pastaria and Deli in Gastown. They sent me this information which I am passing along to you. Pick a nice Chianti and you will be set for a wonderful dinner. Enjoy! (Vancouver) – It’s an accepted fact that Italians are amongst sexiest and most romantic people on the planet – they can even claim St. Valentine (San Valentino) as one of their own. Italians are also great cooks who appreciate flavourful food, simply prepared from the freshest, most exquisite ingredients. On the Sagra of San Valentino, chic couples, from Milano to Roma, Venezia to Genova, stroll cobblestone streets arm in arm, in search of small neighbourhood restaurants in which to celebrate the day with a seductive dinner. You don’t have to go as far as the Via Veneto to celebrate Valentine’s Day Italian-style. In Vancouver’s own little corner of old world charm, Gastown (recently named one of the top four hippest hoods in the world), sitsVicino (‘neighbour’ in Italian), an unpretentious restaurant that is very serious about serving beautiful food at reasonable prices. In honour of San Valentino, Executive Chef Chris Picek has created a special five-courseMenu Compreso that pays homage to the arte and amore of eating and living well. It is only available on Thursday, February 14. Seduction begins with the first spoonful of the Stuzzichino (starter) of leek and roasted garlic soup with crispy duck skin. Next up is the Antipasti (‘before pasta’) course of baked ricotta with caramelized endive, blood orange and fennel pollen dressing. Italians don’t eat pasta on its own as we do, pasta is just one of many courses in a meal and this dinner is no exception. The Pasta course is orzo served with sautéed with Yellowfoot Chanterelles. For the Primi there is a choice betweenRoasted Pork Chop with pepperonata and red wine butter or Ling Cod, with crushed potato, olive tapenade and leek sauce. Now, if you really want to dine like an Italian, this is the point at which you insert an optional cheese (Formaggi) course. However, if that seems like too much, then linger over Dolci – a rich chocolate spice cake. Raise a glass or two of vino (Vicino is now licensed), to San Valentino, and end with an espresso. Then stroll arm and arm over Gastown’s cobblestone streets and imagine you’re in the Brera. What happens after that is up to you. Menu Compreso: $55 for five courses. Restaurant #2 on my list for Dine Out Vancouver is Cobre Restaurant in Gastown. It is described as Nuevo Latin Fusion of Mexican, Cuban, Brazilian and Argentinian flavours. With my group of friends, we tried most of the dishes on the Dine Out menu. My wine pairing between myself and friends was Stoneboat Chorus 2009, which is a blend of Pinot Gris, Pinot Blanc, Viognier, Muller Thurgau, Kerner, Schoenburger. Tropical fruit, citrus and high acidity. Not the best pairing with my dishes, but still an overall nice wine. 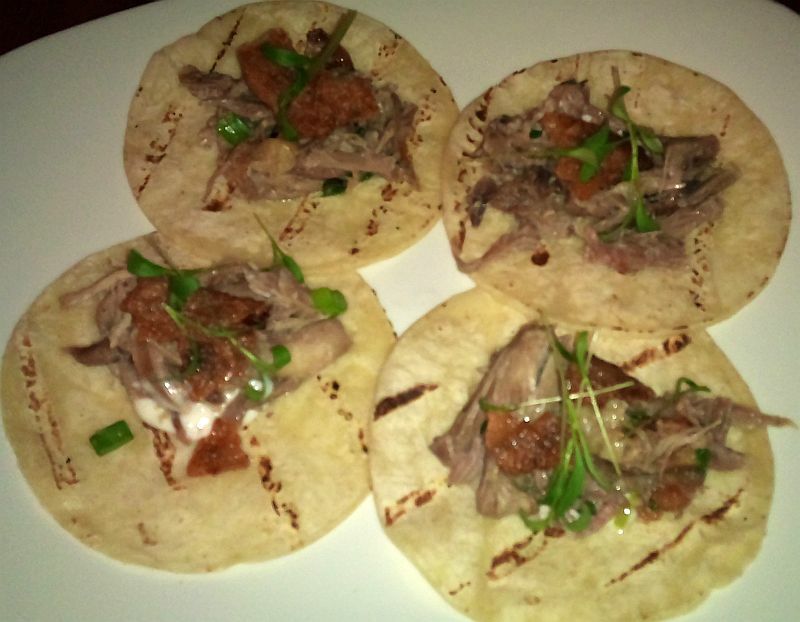 My favourite of my 3 dishes was the pulled duck appetizer. Served on a small tortilla shell. Lots of flavour from this dish. The duck was succulent and garlic added nice flavour to the duck. Add a bit of Mexican hot sauce to this dish for an added kick. 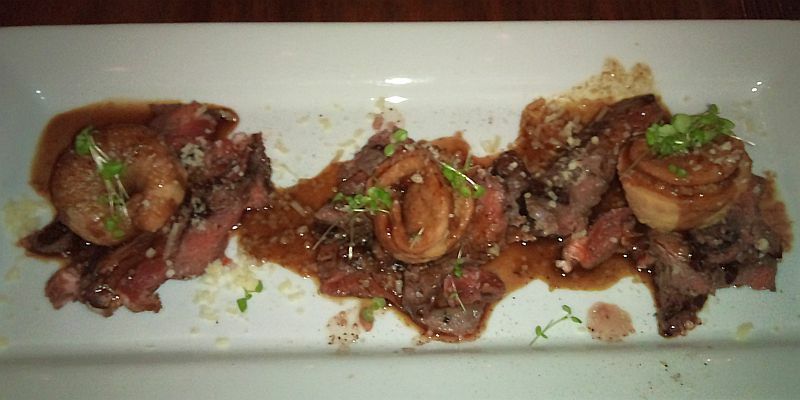 The main course, the BC bison striploin, was a bit gristly. Hopefully this was just something I came across and it was not something you encounter. Topped with this was a empanita, which looked like a tiny tortellini. It had blue cheese inside. To me blue cheese and beefy meat goes together well. 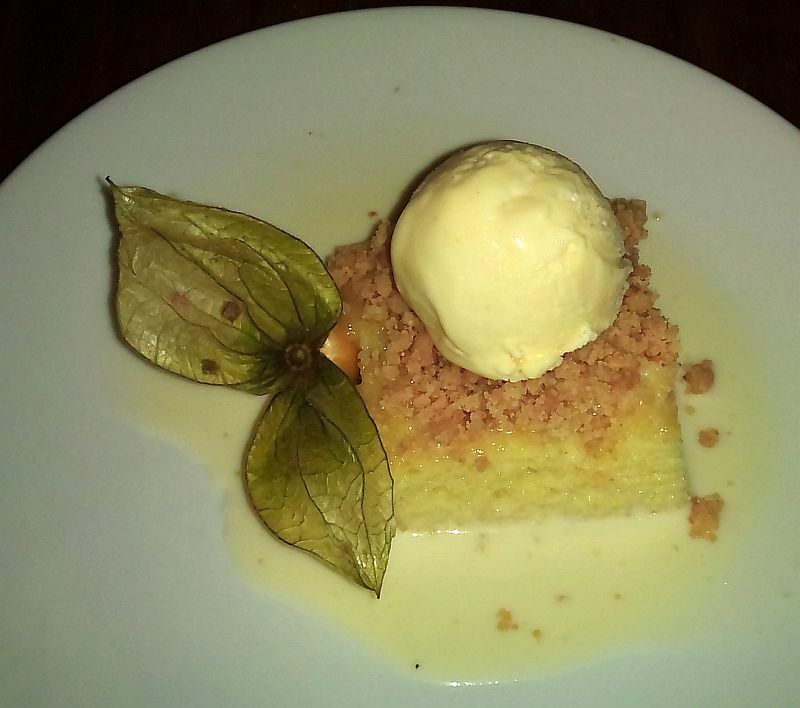 The tres leche cake was topped with a lemon ice cream. The cake was very rich and sweet, and there was also a bit of saltiness with the crunchy topping. I also tried the Taqueria – Battered Baja rockfish, jicama slaw y chipotle aioli appetizer and the Wild Mexican Sea prawns Pipian verde, butter browned corn arepas. Both were excellent. The sea prawns are a bit spicy, so avoid dipping them in the Pipian verde sauce. They are very juicy on their own. Do you know anyone that has cancer? I have, both right now and in the past. Cancer is not a easy disease to cure. That’s why we need more research to help find better ways. To help with this, Mangia e Bevi has a cancer fighting promotion each January. Here is an announcement about their upcoming promotion. December 20, 2011 ( Vancouver , BC ) – Mangia e Bevi Ristorante’s 5th annual charity event, BACIO, will take place throughout January 2012. The popular West Vancouver restaurant will offer a three-course dinner menu for $40 featuring traditional Italian cuisine. $10 from each order will be donated directly to the Lions Gate Oncology Clinic and BC Children’s Hospital Oncology Research in support of important cancer research. Restaurant owners Antonio Sauro, Robert Parrott, and Doug Grisdale started the BACIO (Because a Cure is Obtainable) event in 2008. In the past four years they have raised a total of $109,000 for the Lions Gate Oncology Clinic and BC Children’s Hospital Oncology Research. Mangia e Bevi will wind up the month with a special dinner and auction on January 31st. The “Mangere, Bere, Vivere” (to eat, to drink, to live) dinner will include four courses paired with complementary wines as well as a silent auction. Tickets for the evening are $100 plus taxes. Call today to make your reservations! For more information, or to make your reservation, please call 604-922-8333. Do you ever wonder about how to pair spicy Asian dishes with wine? Here is your chance to try a pairing of Thai food from Maenam with the German wines of Schloss Reinhartshausen. Here is the announcement and menu. Get tickets soon before they quickly sell out. The best Thai food is a perfect balance of 4 taste sensations: hot, sour, sweet, and salty: perfect for Schloss Reinhartshausen’s balanced and finessed wines. Taste how these mouth-watering, luxurious wines compliment Maenam’s aromatic and spicy cuisine. Maenam, 1938 West 4th Avenue. September 27, 2011 6:30 P.M.
One seating only, space is very limited. For the complete menu and to buy tickets, click here. A last minute Tweet to me, asking if I’d like to try some Oregon Pinots, was all I needed to get me to Raincity Grill to try the wines of Amity Vineyards paired with expertly crafted entrees. 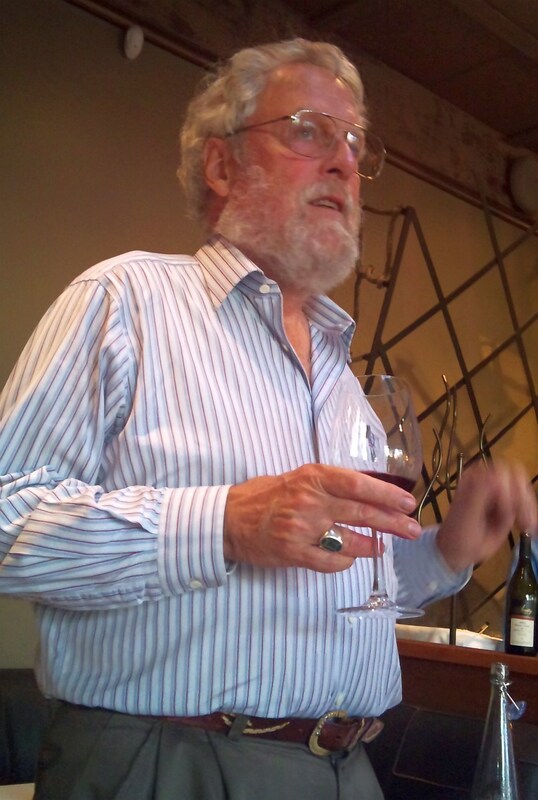 Our pinot passionate speaker was Myron Redford, President & Senior Winemaker of Amity Vineyards. Myron was originally from Seattle and was trained in wine making. He travelled to Europe and was introduced to Pinot Noir. In 1974 a winery in Oregon was available for sale. With the help of his mother, $15,000 secured his ownership of what is now Amity Vineyards. The vines were not originally Pinot Noir or Pinot Blanc, but would be over time. Myron was one of the people on a review board analyzing various clones of Pinot Noir and how they thrived and the type of wines they produced in Oregon. With this knowledge, he selected those clones that would show pinots potential in Oregon, and at his winery. Our first pairing for the evening was House Cured Wild Sockeye Salmon, barigoule vegetable salad with Amity Vineyards Willamette Valley Pinot Blanc 2008. The Pinot Blanc was bright in the glass of a medium lemon colour. Red delicious apple with some citrus aromas. Medium body, dry on the palate but with a roundness to it. More red delicious apple and lemon flavours. High acidity and a bit of sweet spice. This was a nice pairing with the lower acidity of the salad being complemented by the higher acidity of the wine. 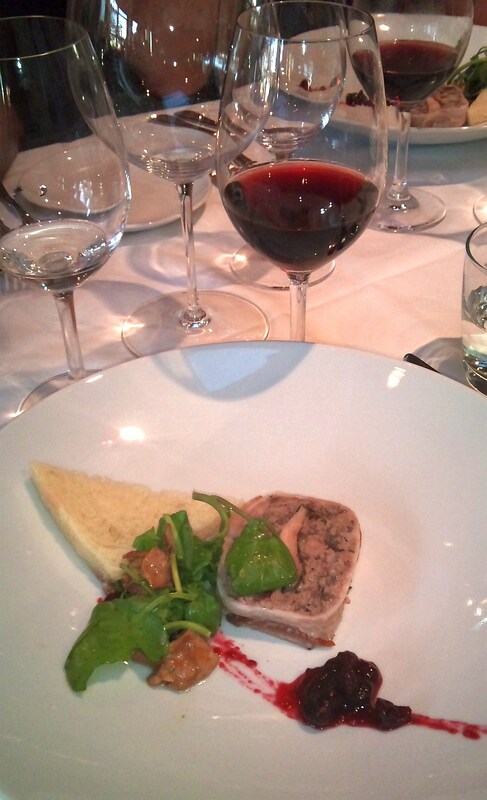 The second pairing was Thiessen Farms Quail Terrine (bacon wrapped country-style terrine, house-made brioche and cranberry compote) with Amity Vineyards Willamette Valley Pinot Noir 2008. This pinot was deep ruby in colour. Nice nose. Light cherry, raspberry, violets and vanilla aromas. Medium body. Round with spice, cherries, and violets flavours up front and nice acidity, followed by vanilla on the mid-palate. Long length. This is one of Amity’s larger quantities of Pinot Noir, with 4000 cases produced. The grapes come from 7 different vineyards. The grapes are kept separate when picked and are fermented and aged separately. Finally these separate wines are blended to produce the final wine. The terrine was exquisite with the smokiness of the bacon and the savoriness of the terrine complementing the acidity and violet aromas and flavours of this wine. Our third pairing was Nicola Valley Bison Flat Iron with plum jus, ‘helmers’ fondant potatoes, hazelnuts, and green beans with Amity Vineyards Winemakers Reserve Pinot Noir 2007. This wine is the top wine from Amity Vineyards. Barrel selected from the best barrels to drink in the future. This wine is not meant to be consumed yet. Full enjoyment comes with patience; 10 years if possible. The 2007 vintage has just been released and for the first time has 40% new oak. Past vintages used older, more neutral barrels for aging. This wine truly was a step above of the previous wine. Deep ruby red in colour. Violet, vanilla, and raspberries on the nose. Later on in the glass you picked up some strawberry leaf and smokiness. Lots of vanilla and vanilla up front. Hot and spicy mid-palate. Dry with tannins and astringency now, which should fade with aging. Medium length. Round with light body and soft tannins. Protein loves tannins in red wine, and the dark gaminess of the bison paired nicely with this Pinot Noir, making both a bit softer. Our final pairing was dessert. Honey roasted apricot tart tatin with thyme ice cream paired with Amity Vineyards Late Harvest Estate Riesling 2007. This wine was made with botrytis affected grapes, which imparts a honey or marmalade flavour to the wine. This wine was light pear coloured. Petrol, peaches, and honey aromas. Good acidity on the palate with peaches, honey and petrol flavours. Medium body with long length. A tasty wine. The apricots in the tart tatin were very flavourful with the acidity of the late harvest Riesling adding additional lively complexity to this dessert. 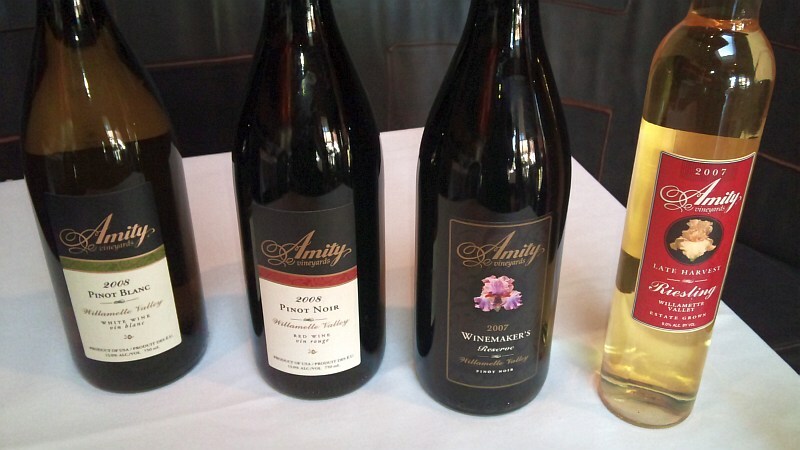 You should be able to find the Amity Vineyards wines in the private liquor stores in Vancouver. Enjoy. Whistler Search and Rescue Society (WSAR) is holding its twelfth annual winemaker’s gourmet dinner and auction, “Wine’d Up”, on October 15th, 2011. Guests at this popular event will enjoy an evening of outstanding food and wine while supporting the critically important work of Whistler’s search and rescue volunteers. Each chef will create a dish with flavours to complement and enhance the selection of fine wines poured with each course. Wines for this year’s dinner are generously being donated by four leading South African wineries: Flat Roof Manor, Moreson (great sparkling wine), Boekenhoutskloof (a premium producer. Makes a wonderful Syrah), and Lammershoek (new to BC. Nice pinotage and more). South Africa’s centuries-old winemaking tradition blends the restrained elegance of the Old World with the accessible fruit-driven styles of the New, creating wines which eloquently express the Cape’s unique terroir. As a special treat, dessert will be paired with Amarula Cream Liqueur. In addition to sensory delights of food and wine, the event will offer guests a chance to participate in both live and silent auctions throughout the evening with items generously donated by businesses in Whistler and throughout B.C. The evening is truly a community effort. Whistler-Blackcomb supports this event each year by donating their facilities and staff at Dusty’s Bar & Grill in Whistler Creekside. Whistler Search and Rescue members volunteer their time at the dinner and auction to ensure everyone has an enjoyable evening. “WSAR is a community driven volunteer organization”, says Brad Sills, SAR Manager, Whistler Search and Rescue Team. “The annual Wine’d Up fundraiser is the single biggest revenue source that WSAR receives. The Team depends on the generous support the Whistler Community has traditionally given at this annual event in order to meet its operational requirements.” Since its inception in 2000 organizers have raised more than $340,000. Brad adds, “WSAR is forever grateful to all the people who organize and support this event”. Tickets are $160 plus hst and are sold through Whistler Blackcomb – 1-800 766 0449. Suggested attire for this event is smart western gear / smart casual. Please also visit the www.mywinepal.com website and read the latest article on signature grapes and wines of South America, and enter to win 1 of 4, $20 Marquis Wine Cellars gift cards!